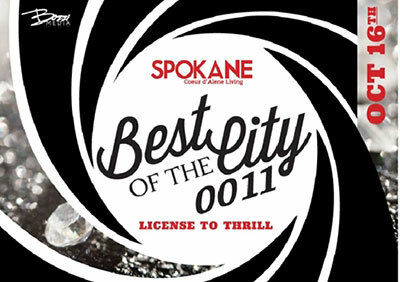 Spokane Coeur d'Alene Living magazine presents the 2015 Best of the City James Bond themed party, 'License to Thrill', this Friday, October 16 from 6-11pm at The Lincoln Center. Contact Ticketswest at www.ticketswest.com or 800-325-SEAT. Kosta's Blues Buddies, led by Kosta Panidis, play 'electric blues' at Boomers Classic Rock Bar and Grill, 18219 E Appleway Avenue in Spokane Valley, Saturday, October 17 from 8:30pm-12:30am. They are a cover band featuring ZZ Top, Stevie Ray Vaughn, Jimi Hendrix, John Mayer, Kenny Wayne Shepherd and more. The band features Pat Bakken on guitar and vocals, Dave Olson on drums, and Kosta on Bass and Vocals. Boomers has great food and there is no cover. Go to Kosta's Blues Buddies on Facebook for more information. 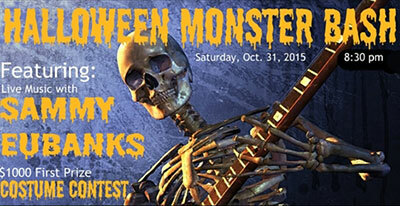 Monster Bash featuring Sammy Eubanks, is at the Red Lion Hotel at the Park Halloween night at 8:30. Reserved tables are available for parties of 8 or more. There's a $1,000 prize for the best costume. Ticketswest has your seats at www.ticketswest.com or 800-325-SEAT. The 2015 MAC Art Auction is Saturday, November 7 from 5 to 9 pm at the Davenport Hotel. Dinner at 7 pm. Tickets are $100 each and the auction benefits the programs of the museum. The art that will be in the silent and live auction is now on display at the Northwest Museum of Arts & Culture until November 1. It's an exciting collection of artwork by local and regional artists. The art was juried by Paul Manoguerra, director/curate at Jundt Art Museum, Gonzaga University. The featured artist for the auction this year is Lila Girvin. The highlight of the auction evening is the Golden Ticket drawing at dinnertime. Before dinner, auction goers may purchase packets of 5 golden tickets for $100. One ticket is drawn, and the winner may choose any item that will be in the live auction-it's a value of up to $5,000. For more information go to macartauction.org. Third Day 'Lead us Back Tour' is this Saturday night, October 17 at 7 pm at the INB Performing Arts Center. Contact Ticketswest. Men's Quartets and Choruses from throughout the Northwest and western Canada are having their 2015 convention and competition this Friday and Saturday, October 16 & 17 at Northern Quest. Tickets are $15 at the door. Go to pagesofharmony.com for all the details. 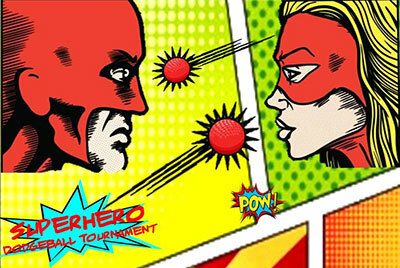 The HUB Sports Center's Super Heroes Pickleball and Dodgeball Tournaments are Saturday October 24, with a portion of the proceeds benefitting Pediatric Oncology at Sacred Heart Children's Hospital. Pickelball runs from 8 am until 4 pm and Dodgeball runs from noon to 7 pm. Dress as your favorite super hero or villain. Use of super powers are not allowed during play. Sign up by October 16. The HUB is located at 19619 E. Cataldo in Liberty Lake. Take the Barker exit and go east on Frontage Road, turn left between Camping World and Freedom RV. Hubsportscenter.org has all the details. The phone number is 509-927-0602. As Halloween approaches the spirit will take over a steep Spokane street that involves high-speed pumpkins and lots of laughs. Meals on Wheels Spokane brings you the 5th Annual Great Pumpkin Race on Saturday, October 24 at 12 pm at Madison and 18th Ave, South Hill. All proceeds will benefit Meals on Wheels to make sure no senior goes hungry this year. Register at www.mowspokane.org. Arrive at 11 am to get your pumpkins race number. Your $5 donation feeds one hungry senior, one pumpkin per person, all ages and organizations welcome. Pumpkins must be under 12 pounds including wheels and chassis, pumpkin must be securely attached to wheels in some way, pumpkin must be gravity powered, flammable and hazardous materials are not welcome. Pumpkins are raced based on age or organization. Prizes awarded for each race at the end. Enjoy sweet treats and drinks. This is a great fall family event and free to be a spectator! The Inland NW Business Travel Association is holding their annual Harvest Moon & HalloWine Auction this Friday, October 16, from 5:30 to 9pm at the Mirabeau Park Hotel & Conference Center. Cost is $45 a person. For tickets and more information, visit www.inbta.org. A portion of the proceeds from this auction will benefit Northwest North Pole Adventures Spokane Fantasy Flight, which provides a magical trip to the North Pole for some very special children from area shelters and community programs. They are flown to the North Pole for an evening of wonderment and surprises. For more information on NW North Pole Adventures please go to their web site at www.nwnorthpole.com. The 2nd Annual NW Taste Show will be held this Friday through Sunday, October 16-18 at the Spokane Convention Center. The Show, a Food & Beverage sampling show, is open to the public to taste, try & buy. Attendees can sample amazing flavors from throughout the region including olive oils & vinegars, coffee, sweet treats, tea, meats and cheese. Attendees over 21 can sample award winning wines, brews, spirits & hard ciders, held in the Grand Tasting Pavilion. This area is hosted by and benefits The Wishing Star Foundation. Meet experts and experience new products and services throughout this three day show. Watch Chef Demonstrations and learn new techniques for living healthy. View entries in the Cake Decorating Competition and see the latest kitchen gadgets, bake ware and BBQ grills. Register to win the Grand Prize, a kitchen full of appliances, compliments of Fred's Appliance, valued at $6500 and the door prize, 'A Taste of Broadway,' 2 tickets to each of 3 Broadway shows - 'A Christmas Story,' '42nd Street' and 'Disney's Newsies.' Bring your appetite to this show, as you'll want to experience all the delicious Tastes of the Northwest. Show Hours are Friday 4-8pm, Saturday 10am-6pm, and Sunday 10am-5pm. Cost is $10 for general admission; $25 includes Grand Tasting Pavilion (must be 21). Visit www.nwtaste.com for more information. One of the most talented heavy metal bands of the 80s brings its unique style and sound to Northern Quest Resort & Casino when Queensryche hits the Pend Oreille Pavilion stage on Sunday, October 25, at 7:30 pm. With more than 30 million records sold worldwide and 15 Top Hits on the Billboard Charts, Queensryche dominated the heavy metal scene with its electrifying combination of hard rock, tireless touring and theatrical live performances. For tickets and information go to northernquest.com. Epicurean Delight is Spokane's biggest cocktail party and the most fun black-tie/formal gala in the Northwest. It's on Friday, November 6, at 6 pm at the Spokane Convention Center. The evening features 30 restaurants and 30 wineries/breweries/cideries. It showcasing some of the most amazing food and libations our region has to offer, and includes live entertainment, restaurant and libation awards, fabulous 'Opportunity Drawing' packages, dancing and balloon drop ticket giveaway. Sponsored by the Inland Northwest Blood Center, proceeds benefit education, technology and research grants and scholarships made by the Blood Center Foundation. Go to bloodcenterfoundation.com for tickets and information. The Classics series continue as the Spokane Symphony presents Scottish Fantasies, with Resident Conductor Morihiko Nakahara, and guest violinist Mateusz Wolski. Music presented includes Maxwell Davies' Orkney Wedding with Sunrise, Bruch's Scottish Fantasy for Violin and Orchestra, and Mendelssohn's Symphony No. 3 in A Minor (Scottish). Performances are Saturday, October 24 at 8pm and Sunday, October 25 at 3pm. Tickets available through www.ticketswest.com or 800-325-SEAT. 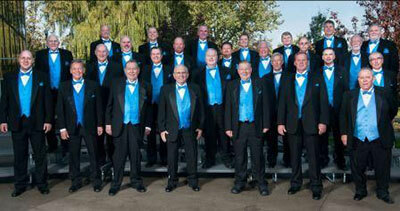 To find out more about the performance, visit www.spokanesymphony.org. Arbor Crest Wine Cellars wants the live music to continue all this month at their Tasting Room at the Cliff House Estate. Every Thursday and Friday, for the remainder of October, the 'Arbor Crest Wine Bar' will feature food, wine flights, premium beer from 5 to 8pm and live music from 5:30 to 7:30. This Thursday & Friday, October 15 & 16, Bill Bozly performs. Don't miss your last week to see 'Catch Me if You Can - the Musical' at the Spokane Civic Theater. Performances are this Thursday through Saturday, October 15 through 17 at 7:30 and Sunday, October 18 at 2pm. For tickets and information, visit www.spokanecivictheatre.com. Today, October 14, The Ridiculous Reed Man, Charles Swanson with Nick Schauer on guitar performs. Music is from 5:30 to 8:30 at 6325 N Wall. Full bar and food available for purchase. Nick Schauer and Charles Swanson will also perform this Saturday, October 17 at Left Bank Wine bar from 7 to 10pm. The Southside Senior Center presents Variety Pak, a local dance band, to perform Friday, October 23 from 7 to 9:30pm. Variety Pak, a 5-piece dance band, plays danceable music from the 20s through the 80s. The Center is located at 3151 E 27th on the South Hill, the cost is $8 for members and $10 for non-members. Tickets available at the door. Food and drinks available for purchase. On Tuesday, October 20, spend an evening celebrating the incomparable Bing Crosby, Howard's uncle, as Howard sings from Bing's catalogue of songs from the 1930s to the 1970s. Joining Howard on piano will be the celebrated accompanist, Randy Kaping. Howard and Randy will treat the audience to songs from Bing's film, radio, and recording career, across genres, including Irish tunes from Bing's ancestral heritage. Hot Club of Spokane will also join Howard on stage to perform tunes from Bing's early years in the 1920s jazz scene. Performance begins at 7pm. Tickets are available at TicketsWest at www.ticketswest.com or 800-325-SEAT. The 3rd annual Craft Beer & Cookie Fest pairs local craft beers with Girl Scout Cookies for a fun and unique fundraiser, benefitting Girl Scouts of Eastern Washington and Northern Idaho. The festival is from 4-7pm on Saturday, October 24, at the Girl Scout Program Center, 1404 N. Ash St. in Spokane. Tickets are $15 in advance and $20 at the door and include three tasting pours paired with Girl Scout cookies, a complimentary sausage from Nick's Shameless Sausages, live music from Drew Blincow, games and fun! This year's Craft Beer and Cookie Fest has expanded and will feature eight breweries with a total of nine beer and cookie pairings. The participating breweries include; Iron Goat Brewing Co, River City Brewing, English Setter, Lagunitas Brewing, Black Label Brewing Company, Alaskan Brewing Company, Waddell's Brewing and New Boundary Brewing. The ticket price includes three, 4 oz. tasting pours, cookies and a brat dog. This is a 21 and older event. Purchase your tickets craftbeerandcookiefest.brownpapertickets.com or contact Stephanie May, Events Specialist at 509-747-8091, ext. 204, email smay@gsewni.org. 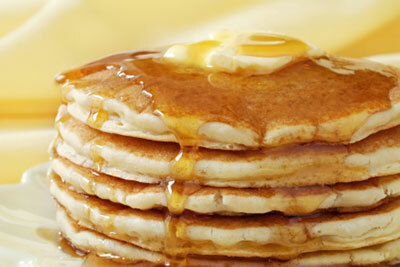 Enjoy all you can eat applesauce, pancakes, eggs, sausage, OJ, and drinks Sundays, October 18 and 25, from 8 to 11 am at the Green Bluff Grange, 9809 E. Green Bluff Rd. Adults $6, 5-12 years $3.50, under 5 free. For more information call 509-979-2607, email greenbluffgrange@gmail.com or see their facebook page.